Stop your Search! Dreams Do Come True! 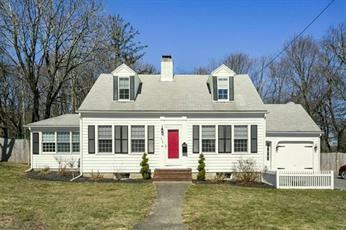 Immaculate 4 Bedroom Cape with Attached Garage Located in the Heart of Weymouth! Excellent Open Floor Plan! Spacious Formal Livingroom with Wood Burning Fireplace! Large Formal Diningroom! Custom Gourmet Kitchen with Granite Countertops, Abundant Cabinetry & Stainless Steel Appliances! Every Chef’s Dream! Glistening Sunshine & Windows are Everywhere! Wide-Pine Floors! Two Renovated Bathrooms! Large Master Bedroom! Beautifully Landscaped Front Yard and a Fenced in Back Yard Perfect or Entertaining! Full Basement with Excellent Ceiling Height! Nest Thermostat, Recessed Lighting, Laundry and Much More! Be in Downtown Boston in 30 minutes! A Tremendous Value! Don’t Miss Out on this Charming Home! Truly one of a kind!